If you want the power of a gas engine and don't mind refilling your trimmer's gas or oil, you'll enjoy using an entry-level gas trimmer. Mid-grade trimmers are a step up, offering more features, comforts, and ease of use. These are for the homeowner who has more than minimal trimming to do. 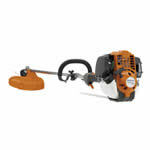 What makes mid-grade gas trimmers an upgrade from entry-level trimmers? If you're a weekend warrior who wants to get a professional look without paying the professional price, a mid-grade gas string trimmer might be right for you. 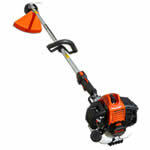 Homeowners may be interested in investing in a commercial gas handheld string trimmer because they'll last longer. If you have a large lot, or you find yourself trimming a few times a week, it may be a worthwhile investment to ensure that your trimmer will stand up to the challenge and never let you down. Gas Handheld String Trimmer Buyer's Guide.. Our Power Equipment Direct how-to library can help you learn about How to Measure Cordless String Trimmer Power, Straight Shaft vs Curved Shaft String Trimmers and 2-Stroke vs 4-Stroke String Trimmers.